How Do You Retain Large Volumes Of Files & Documents? Document storage is the core of our business and when done professionally is a simple, secure, non-intrusive way of dealing with your documents in a cost effective manner. Using our service will also help fulfil your legal requirements for data retention and data protection. Site visit to assess your requirements and gain an understanding of what you would like from us, restrictions you may have, concerns you may have, provide options and based on those discussions we will be able to submit a proposal to you along with costs. Files/documents are boxed and bar coded. This can be done by our staff or by your staff. Inventory of documents created. Again, this can be done by our staff or by your staff. Documents are removed from your office by our staff who are uniformed and using vans/lorries clearly marked with the company name. 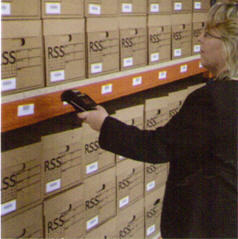 Boxes are then scanned into our warehouse facility. Please note that the file is already scanned into a particular box and the box is scanned to a location in the file store. We then issue you with a comprehensive report in spreadsheet format containing all your information which you can use for retrieving your files. All future movement of the file is recorded with the date the file initially came to RSS, who requested it and when, return date etc. up to and including its destruction. This chain of custody information is kept indefinitely. All our processes are designed to be flexible so as we can tailor our service to suit your needs and your systems.